We’re getting closer to April 7, when the annual Rock & Roll Hall Of Fame induction ceremony—and the subsequent annual fights about the merits and worth of the Rock & Roll Hall Of Fame—are slated to take place. But despite its much-argued flaws, the Hall does occasionally nail a match-up of inductor and inductee, with The Associated Press reporting that Neil Young will be welcoming his long-time collaborators Pearl Jam into the fold. 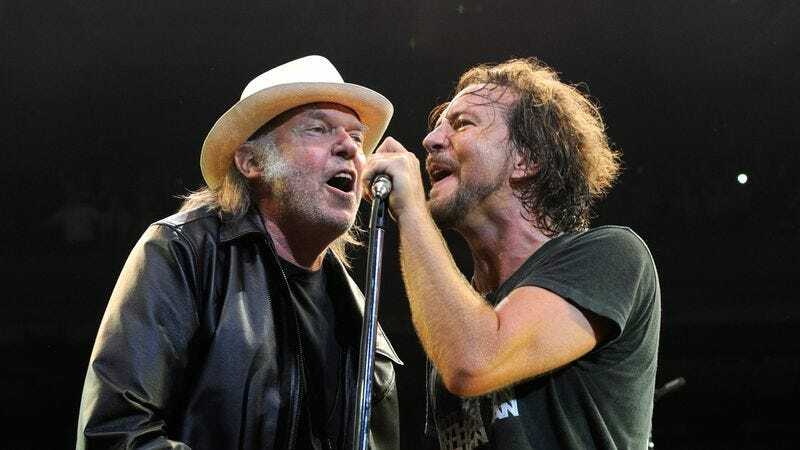 Young hooked up with Eddie Vedder and co. back in the early ’90s, when the rising grunge movement embraced him as its “Godfather.” While touring together in 1993, Young and Pearl Jam would occasionally team up to close out shows with “Rockin’ In The Free World,” and, in 1995, they all collaborated on Young’s album Mirror Ball. Now, Young—who’s been a member of the Hall for more than 20 years—will welcome the band into one of music’s most argued-about clubs. Other inductees at this year ceremony include Yes, which will be presented by members of Rush, and Joan Baez, by Jackson Browne. Tupac Shakur, ELO, Journey, and Nile Rogers will also be honored, although the artists inducting them have yet to be announced.